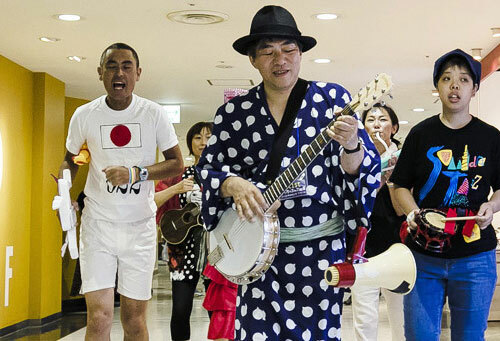 Ensembles Tokyo is a participation-based music festival in which anyone can take part. The area in front of Tokyo Tower, the south side parking lot and other locations. Ensembles Tokyo is a participatory music festival that anyone can take part in. Under the direction of musician Yoshihide Otomo, the aim is for everyone who takes part to create their own musical arena, transcending respective standpoints and styles. For this its third year, the festival is taking place at the city’s iconic Tokyo Tower. Organizers hope the event will spread the power of arts and culture far and wide, as it explores Tokyo’s uniqueness and diversity from the new venue. Tokyo Tower is a popular tourist destination and gathering place for different people from Japan and overseas. On the day of the event, there will be an audience participation-based live performance with artists UA featuring Toshiro Inaba, Yoshihide Otomo Special Big Band, Miu Sakamoto and CANTUS, Yasuhiro Yoshigaki and Orquesta Nudge! Nudge!, plus members of the public who have done an advance workshop. 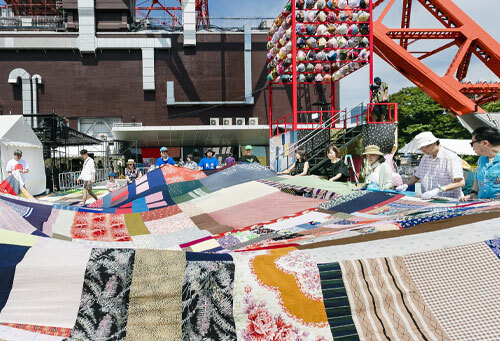 Representing a new type of participatory music festival, there will also be a giant furoshiki cloth wrapper-making workshop run by the Project FUKUSHIMA! group, who will then join the general public in event production duties, putting together a giant furoshiki installation. A pre-event will be held at GOOD DESIGN Marunouchi ahead of Ensembles Tokyo. This is your chance to find out about a music festival created by everyone who participates, and the activities of Project FUKUSHIMA! There will also be a live performance by Yoshihide Otomo who is also artistic director of the festival. Reservation starts from Tuesday, 1 August from 10:00. Send an e-mail to etws@ensembles .info with the subject line “Ensembles Tokyo Pre-Event”, including your name, age and telephone number. ※ People with reservations will be given priority admission on the day. ※ In the event of a full house you may have to stand. ※ Your personal information will be handled as strictly confidential, and used only to send you information from the organizer about this event. ※ Prior to the pre-event from 14:00 ~ 17:30 on Tuesday, September 5, the Giant Furoshiki Making Workshop is scheduled to take place at the same venue. No application is needed for this, so please feel free to attend both events. Yasuhiro Yoshigaki with Orquesta Nudge! Nudge! Ensembles Tokyo is a music festival that everyone creates together with artists. We’re looking for people to take part in workshops and then either perform together with artists on the day of the event or help get things rolling by joining others to create giant furoshiki cloths art installation. Four music workshops will be held in advance. Participants will receive guidance directly from artists to prepare for the event on October 15, when everyone will spread out giant furoshiki for an on-site art installation and then perform together with the artists. A workshop with Project FUKUSHIMA! will also be held to put together the furoshiki installation. Participants in the music workshops are also invited to bring cloth to be used in making the furoshiki installation. People are welcome to take part in both the music and furoshiki workshops. Project FUKUSHIMA! "Giant Furoshiki Making Workshop"
Workshop participants will create giant furoshiki, using sewing machines to join together cloth gathered from many different areas. Those who have never used a sewing machine before are welcome to take part, and it’s okay if you can only join in for a short time. The giant furoshiki will be used to decorate the venue as backdrops and tents. Let’s spread the thoughts of all sorts of people throughout the venue on Sunday, October 15. * Please come and join anytime during the hours above. Please bring cloth to be used in creating the furoshiki. Beautiful colors and large pieces are especially welcome. It is okay to bring leftover material from home. Small pieces are fine too! Please send an e-mail to the address below stating the name of your workshop of choice, your name and telephone number. Applicants will be contacted shortly with details. * There is a possibility that workshops may go slightly beyond their scheduled end time. Please plan accordingly. Yoshihide Otomo Special Big Band "Any-instrument big band workshop"
This workshop does away with notions of good or bad play, can or can’t play; participants can simply enjoy sharing the experience of playing with lots of other people. Anyone is welcome regardless of gender, nationality or age. Any instrument is okay if you can bring it and play it. A musical instrument you are able to bring and play yourself. UA with Toshiro Inaba "Voice workshop Voicing and listening"
Resonate. Form a circle. Let’s start with vowels. My sound, your sound, his sound, the child’s sound. Like the heart, sound knows no division. There are no mistakes in mingled sounds; we’ll play as we are. Let’s emit sound for the sake of our kidneys, feel the workings of our diaphragms, sift through our brains. Let’s sing of tomorrow, and the day after tomorrow, just as we do now. How to make a passionate voice, a cold voice. You’ll remember who you are. Let’s create an uncharted, resonant live performance. Miu Sakamoto and CANTUS "Workshop: Make your voice an instrument!" Yasuhiro Yoshigaki and Orquestra Nudge! Nudge! "Rhythm Ensemble Workshop"
In this workshop, participants bring all sorts ?percussion instruments, homemade instruments, non-percussion instruments, things that make sound?and perform together. Form a rhythm ensemble with Yasuhiro Yoshigaki and Orquestra Nudge! Nudge! and then perform together at Tokyo Tower. * You can participate for one day only, or join after the program has started. Bring anything you want as long as it’s a percussion instrument, homemade instrument, non-percussion instrument, or something that makes sound.